← The Best Invention for Modern Travel? This is an article my wife wrote after our trip to Italy several years ago. 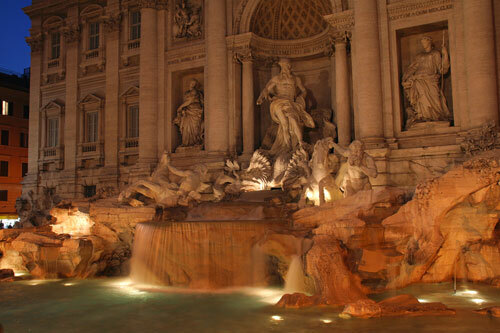 The tips are still good today as Italy is still one of the most popular tourist destinations in the world. Italy is one of my favorite vacation spots – maybe it’s my Italian ancestry, maybe it’s the fantastic art and architecture, maybe it’s the food and the gelato, or maybe it’s all of the above. There’s just something about Italy that makes me feel at home. Unfortunately, during our last visit to Italy, I was amazed at the number of tourists everywhere, especially American tourists. Could Dan Brown’s “The DaVinci Code” have inspired so many tourists? Even though Rome is a huge city, it is one large city definitely worth spending some time in. There is much to see and do in this wonderful metropolis. Listed below are a few of Rome’s many “must see” tourist stops and tips on how to maximize your experience while minimizing your frustration. 1. 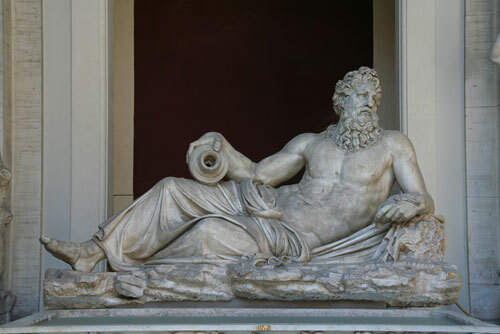 Sistine Chapel and Vatican Museum: The Sistine Chapel is on most Rome visitors’ lists of required viewing. After winding your way through the numerous rooms, floors, and long hallways of the Vatican Museum, your visit to the museum culminates in the Sistine Chapel where Michelangelo’s frescoes on the ceiling and altar leave you breathless. We thought we’d arrive at the Museum early to avoid the crowds but arriving two hours before opening was not enough – the line to enter the Museum wound along several blocks of sidewalk and was multiple people deep. Tip: Go with a tour – the added cost is well worth the money. Just moments after getting in line, a young man was asking if anyone wanted to join a tour. We jumped on the chance – tours enter through a different entrance and seem to get preference. Our local tour guide led us to view some of the more spectacular sculptures and paintings in the museum while providing interesting commentary. We then entered the Sistine Chapel and after some time there, the tour continued in St. Peter’s Basilica. Joining the tour saved us hours in line and provided us with information about the art that we otherwise would not have gotten. 2. St. Peter’s Basilica: Definitely another Rome “must see”, St. Peter’s Basilica is probably the most spectacular church in the world. 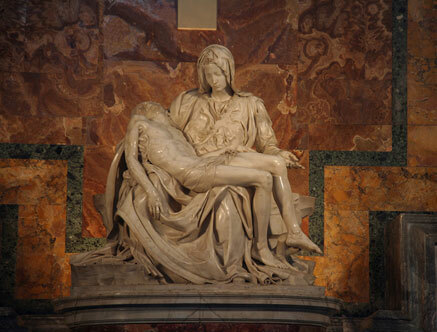 Housed inside are Michelangelo’s beautiful Pieta sculpture and an altar and canopy by Bernini. The Basilica is massive with much to see, however, the hoards of people everywhere make close inspection of the art difficult and frustrating. And forget about having any time for quiet contemplation or prayer amid the crowds. Tip: Return to the Basilica an hour before closing time. We returned in the evening in hopes of getting closer to the Pieta for photos. The sunrays coming in through the stained glass bathed the Basilica in a soft, beautiful light and there were virtually no tourists to get in our way. 3. Castel St’Angelo: Throughout history, the Castel St’Angelo has served many purposes, from an emperor’s tomb to a prison and from a castle to a safe haven for popes. Tip: I admit that I wasn’t much impressed by what this modern-day museum has to offer but because it is a short walking distance from St. Peter’s Basilica, and because the line to climb to the top of St. Peter’s Basilica dome is usually quite long, the best place to get a good view of the Roman skyline is from the top of Castel St’Angelo. 4. 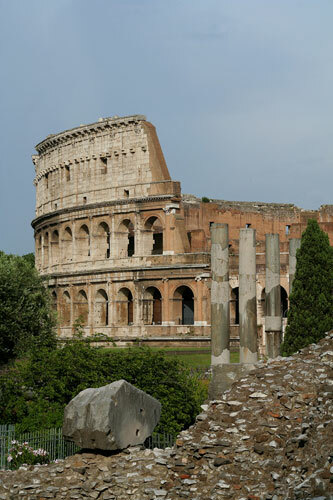 Colosseum: Where ancient Romans held gladiator contents, the Colosseum is one of Rome’s most recognized structures. Because the original floor of the Colosseum is missing, you can see where the wild animals that fought the gladiators were kept before they entered the arena. And because it is the epitome of Rome, the ticket lines to enter the Colosseum can be extremely long. Tip: We took Rick Steve’s advice and purchased Roma cards. The cards allowed us to bypass the long ticket lines at the Colosseum. The cards are not that expensive and are valid for 3 days. The Roma Card provides free fares on public transportation and free or reduced entrance fees to many of Rome’s sites. We purchased ours at the main train station in Rome but they are also available at the airport and other sites around town. 5. St. Peter-in-Chains Church: Not as well-known as the other churches and sites in Rome, St. Peter-in-Chains is well worth the stop. It is the home of Michelangelo’s Moses sculpture as well as the chains that once bound St. Peter. Because it is less well-known, not as many tourists, especially large tour groups, visit this church so you will have the time and space to study the beautiful Moses sculpture. Tip: St. Peter-in-Chains church is a short walk from the Colosseum and is very close to a Metro stop. Stop by the church before or after you visit the Colosseum. 6. Trevi Fountain: Myth has it that if you throw a coin over your shoulder into the Trevi Foundation, you will one day return to Rome – that’s one superstition that I’m willing to believe while in the wonderful city of Rome! Day or night there are always crowds of people milling around the Fountain. Tip: Since there is not much you can do to avoid the crowds at the Trevi Fountain, grab a dish of gelato from one of the many gelaterias in the area and enjoy the people watching. Rome doesn’t get much better than this! 7. Catacombs: The catacombs are miles of underground tunnels and chambers where ancient Christians were buried from the first through fifth centuries. The bones from these ancient burial sites have been removed and although many people find the tunnels a bit creepy, the catacombs are an interesting part of historical Rome. Most tourists choose to visit the catacombs along the Appian Way. Tip: For a less crowded catacomb experience, we took another tip from Rick Steve’s book and visited the Catacombs of Priscilla. These catacombs lie beneath what used to be the home of Roman nobility. Our tour was led by a nun and included only eight tourists. We were able to observe up-close, stunning colored paintings in many of the underground chambers – artwork that I do not remember seeing in the catacombs along the Appian Way. When traveling abroad, we like the adventure of figuring out the local mass transit systems so we hopped on a local bus that took us to the general area. We then wandered around the local neighborhoods until we spotted the sign for the Catacombs of Priscilla. If you’d prefer to take a taxi, you would get to the catacombs a little quicker, but at a price. Final tips: The best time to visit Rome and avoid the inevitable crowds is during the off-season from late fall to early spring. Regardless of when you go, however, Rome is a magical place that will capture your imagination. And be sure to eat lots and lots of gelato! Ciao bella! This entry was posted in International Travel, Travel Inspiration, Travel Tips and tagged Castel St'Angelo, Catacombs, Coliseum, Colosseum, Italy, most popular tourist attractions, Rome, Sistine Chapel, St. Peter's Basilica, St. Peter-in-Chains Church, travel tips, Trevi Fountain, Vatican Museum. Bookmark the permalink.